In the third and last test match of between India and South Africa, Proteas scored 17runs and lost their 1st wicket, on the 3rd day of Johannesburg test. Visitors scored 247 runs and sets a target of 241 runs for hosts. Due to odd bounce, the play was called off as both the captains, India's Virat Kohli and South Africa's Faf du Plessis discussed the issue with match referee Andy Pyrcroft. South Africa reached 17/1 after play was called off with the condition of the pitch being discussed on the third day after India set-up a target of 241 for the hosts to win the third and final Test here on Friday. Due to odd bounce, the play was called off as both the captains, India’s Virat Kohli and South Africa’s Faf du Plessis discussed the issue with match referee Andy Pyrcroft. Earlier in the day, India put up a gutsy show with the bat before being bowled out for 247. 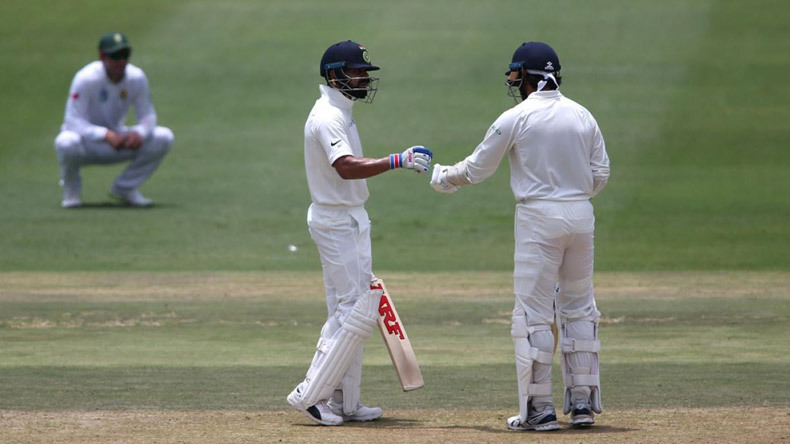 Following is the scorecard from the third day of the third Test played between South Africa and India at the New Wanderers Stadium here on Friday.